Remember learning about the majestic Monarch butterfly and its annual winter migration from Canada and the U.S. to Mexico in grade school science? It's the stuff that National Geographic shows are made of! But experts are worried the phenomenon might be on its last legs. 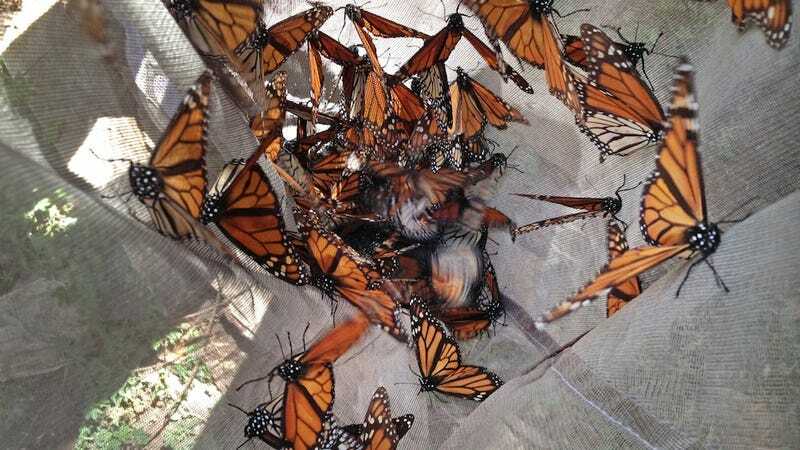 "They were part of the landscape of the Day of the Dead, when you could see them flitting around the graveyards," said Gloria Tavera, the director of the reserve. "This year was the first time in memory that they weren't there." "The main culprit," he wrote in an email, is now genetically modified "herbicide-resistant corn and soybean crops and herbicides in the USA," which "leads to the wholesale killing of the monarch's principal food plant, common milkweed." As Slate explains, that's likely thanks in no small part to the Midwestern boom in corn and soybean crops—thanks to the demand from biofuels. The irony! Farmers want to get the max from every square foot of land, so they're drowning milkweed and everything else in herbicides, to a degree that's only recently become possible. The species itself isn't endangered—there are still populations across the globe. But it's sure going to be depressing if the Monarch migration gets bumped to the chapter about melting glaciers and dead rhinos.